Reflex have installed an amazing 700m2 interactive LED seamless sports floor. 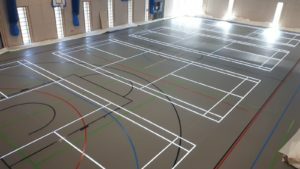 Featuring badminton, football, dodgeball and interactive games lines. With the ability to light up the lines you want you can switch courts and markings using your smart device. Increasing the possibilities for enticing additional clients, and therefore creating extra revenue, the Reflex LED seamless Sports floor is a game changer.